We would like to introduce you to the staff of Valentino's Salon. Bonnie and Kathleen co-founded Valentino’s in 1990. She loves making people feel beautiful by taking care of their hands and feet. In a world that’s pretty hectic, Bonnie enjoys helping people take a little time to treat themselves while giving them the pampering that helps them relax. Bonnie’s greatest passions in life are chocolate and France, along with traveling and cooking. Bonnie provides hand-painted nail art as part of her love for painting and craftwork. She continually seeks out new treatments and has taken advanced training courses through CND and OPI. Kathleen co-founder of Valentino's, enjoys her relationships with each of her clients and considers herself truly fortunate to offer both manicuring services & massage therapy in a small business with her friends. Kathleen received her manicuring license over 25 years ago and continues to stay current in the craft. Discovering which products work for each client is one of her greatest pleasures as well as the transformation of someone's nails after each and every service. 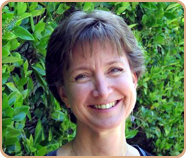 Her massage sessions are designed to promote healing through a deep state of relaxation. All work is aligned with the belief that the body has its own innate intelligence and ability to heal itself. Kathleen helps facilitates this process. Christina (Chrissy) is a licensed manicurist with 20 years of experience pampering her clientele. She studied at Don's Beauty School in San Mateo, and became a licensed esthetician after attending Skyline Spa Treatments. Bonnie and Kathleen invited Chrissy to join Valentino's twenty years ago and she has been with them ever since. As a flight attendant, she has traveled all over the world. In her free time, she enjoys creating delicious gourmet meals and working out. She is constantly searching for new products, techniques, and ways to improve her client's nails and skin. Patti is a licensed manicurist who adores working at Valentino’s. because she works with all of her friends. Patti loves giving manicures and pedicures, and has been told that she offers a great massage. If you want to be pampered, Patti is your girl. She believes that respect, love, kindness and professionalism are the back bone of Valentino's. Lena has recently joined the Valentino's team. She has been working as a manicurist for the last 20 years, working in Beverly Hills for the last 10 years. She speaks Russian & English. She considers herself a perfectionist & enjoys making her clients happy and beautiful. Lena prides herself in building warm relationships with her clients. We find her to be very friendly, & loyal with a great personality. Dina's passion for hair styling began with the braiding of her Barbie's hair at age 7 and the rest was destiny! 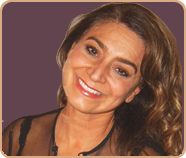 As a licensed cosmetologist since 1990, Dina has over 20 years experience as a hair stylist in the Burlingame area. Always on top of the latest styles and trends, Dina is a dedicated beautician with a keen eye towards the most flattering cut for a client. Dina specializes in highlights and short haircuts, but she applies her perfectionist vision to each individual; always bringing out their best. When she's not with clients or researching what is currently in vogue, Dina loves to spend time with her husband and three children. Lourdes is a CMT with formal training in Los Angeles at the Institute of Psycho-Structural Balancing in Culver City. She continued her training in Carmel at the Monterey Institute of Touch. Her specialty is soft, deep, relaxing massages. She uses the Swedish method as well as other techniques such as the Myofascia Release. She is passionate about her profession & loves working with everyone at Valentino's. Valentino's inviting atmosphere is largely due to the ambiance of Antique Décor by Marie Croft Antiques. George and Michele have been in the home decor business and partners with Valentino’s for 20 years. They enjoy finding items that people can decorate their homes with that will bring them joy for years to come. George is the primary buyer of this team, and searches far and wide for eclectic items for their customers. Michele's background is in fashion and is the decorator of this duo. 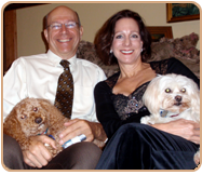 In their spare time, George and Michele love to hike with their 2 dogs, Lola and Bo.